Gareth had his first ever sleepover Saturday evening (parents' anniversary, so we kept his friend half the day Saturday and pretty much all day Sunday so they could get out of town for a bit). I had a clarinet choir concert today so knew I wouldn't have time to make a leek quiche or anything like that for dinner. I decided that a great activity would be to have the boys help me make sugar cookies to celebrate St. David's Day. 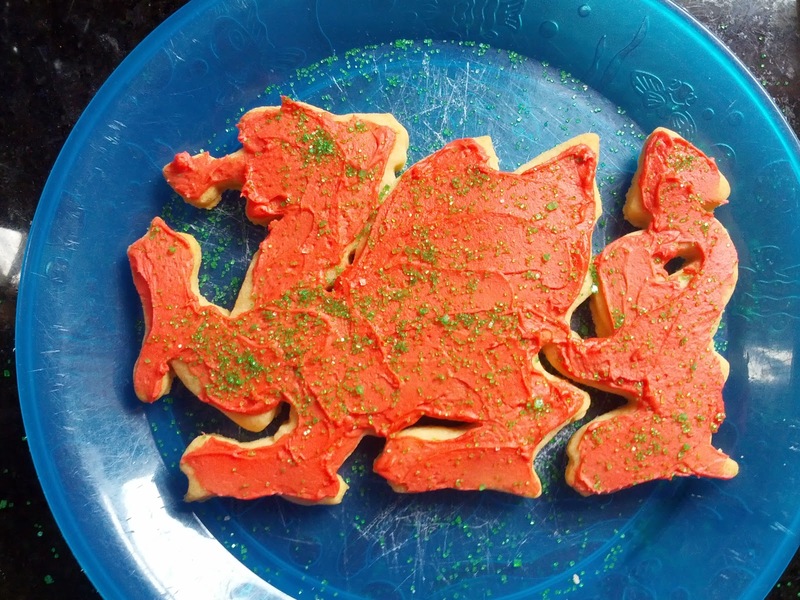 So Saturday afternoon they helped me mix up the dough and helped to cut out a few ddraig goch cookies. Unfortunately, not an easy cookie for kids to help with as it has many fragile sections. So after a few they ran off and played while I finished up. Then before lunch today we frosted them red. The boys overdid the random sprinkles, but I kept all mine simple, just throwing on some green sugar. Maybe some year I'll attempt to get fancy and try to differentiate parts of the dragon. But I'm doubtful I'll be capable of that. A single batch of dough only made 10 cookies (rather large). I took half of them over to some friends. Their query: "You have a Welsh dragon cookie cutter??" Wrth gwrs! Thanks to my mom for getting this for me, knowing I've been wanting one for years!